I’ve had the good fortune recently to read two upcoming releases, both debuts, that explore the unintended and sometimes darker consequences of pursuing the American dream. In a serendipitous contrast, one does that exploration as a comedy and the other as a tragedy. 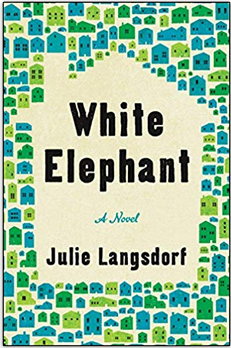 You know you’re doing something right when the New York Times designates your debut novel as one of the “Twelve Novels to Watch for in March,” as that paper did for Julie Langsdorf’s White Elephant, a dark comedy of first-world problems in quaint and fraught suburbia. Langsdorf skillfully skewers the dark, secret hearts behind the outward show of social respectability and neighborly fellowship. In the quiet, leafy-green town of Willard Park, just outside of Washington, D.C., battle lines are being drawn between the residents who truly love their tiny, charming Sears Craftsman cottages, and those who perhaps wouldn’t mind tearing theirs down and replacing them with a plus-sized faux bungalow featuring smart technology and a wine cellar. The chief combatants are Ted Miller, who brought his wife and daughter to live in the small house he grew up in with his parents and developmentally challenged brother, and Nick Cox, a developer who has moved his family from South Carolina, leaving behind a history of building code violations. Nick has constructed a taste-challenged castle for his family on one side of the Millers, and is hoping to find a buyer for the vast, debt-laden monstrosity he is building on the other, the neighborhood’s titular white elephant. The battle is fully joined when Nick, going overboard with the chainsaw, cuts down the red maple Ted planted when daughter Jillian was born. In the middle is Ted’s wife Allison, who fantasizes about Ted and Nick fighting a duel, with her as the prize to the man left standing. Which dream wins: Tree-hugger Ted or Cut-‘em-down Nick? As the neighborhood increasingly divides over a proposed building moratorium, things get ugly, and the veneer of community cracks to reveal dark streaks of pettiness and discontent. Langsdorf delivers a darkly funny, trenchant view into the self-absorbed of suburbia, who perhaps believed themselves to be more special than they are, or have too late discovered that what they thought they wanted—especially when it comes to spouses, and possibly children—isn’t it. These are adults who haven’t quite figured out how to grow up. In this well-heeled neighborhood, the only one who seems truly happy is Ted’s unflappable brother Terrance, who can teach us a thing or two about noticing and embracing what we have, rather than forever searching for more, different, or better. “My husband asked me to lie,” says Young Yoo in the first sentence of this courtroom drama set in small-town America, a fitting opening in almost every way. Though we hear many points of view throughout Miracle Creek, Young is the moral center of this story that examines the many lies we tell ourselves and others, and the lasting damage those lies wreak. Also fitting, Young is the only character who speaks to us in first person, and only here in the beginning, to describe “The Incident” that sets up the murder trial that unfolds through the rest of the story. In tiny Miracle Creek, Virginia, Young and her husband Pak own Miracle Submarine, a pressurized chamber used to deliver pure oxygen to clients on the theory that it helps to treat a variety of conditions, primarily autism and other developmental issues. The central question is: who set the fire at the submarine that killed a young boy and a mother of five, and wounded several others, including Pak and the Yoos’ daughter Mary? 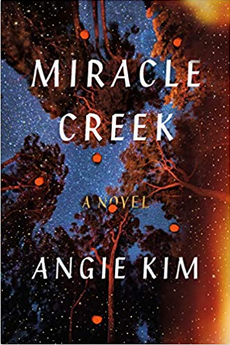 Author Angie Kim draws on her experience as a trial lawyer to weave an engrossing plot in which victims and witnesses tell their stories, with greater or lesser degrees of truthfulness, while the prosecutor pursues his “airtight” case of first-degree murder against Elizabeth Ward for starting the fire that killed her son Henry and best friend Kitt. The prosecutor appears to have a strong case, until Elizabeth’s defense lawyer starts to punch holes in his theory of the crime, and draw attention to Pak as another possible suspect, whom she suggests wanted the insurance money. The prosecutor appears to have a strong case, until Elizabeth’s defense lawyer starts to punch holes in his theory of the crime, and draw attention to Pak as another possible suspect, whom she suggests wanted the insurance money. Pak has already sacrificed family unity to pursue the American dream for Mary, by sending her and Young from Seoul to Baltimore while he stays behind, waiting to join them. In the intervening four years, Young is forced to work seven days a week, leaving Mary entirely on her own to navigate a foreign language and culture amid the brutal rituals of high school. Young suffers from the irreparable damage to her family even before the fire; in the aftermath, she wonders what else her husband might be willing to sacrifice in his implacable focus on achieving a dream that to her now feels like a nightmare. Kim expertly keeps us guessing as to which character did what, and who was ultimately responsible, since there are many here with secrets they don’t want exposed. She delivers a taut and compelling story that earns the note of hopefulness on which it ends.